The question was whether dual coding could be stimulated and developed for children with severely delayed language development or for those diagnosed with an autism spectrum disorder. It seemed clear that these children might be the most impaired in terms of creating and accessing imagery, the other half of the code. Chip is in first grade, and has had a full-time tutor since he was three. His poor communication skills are causing him social difficulty, and he has difficulty expressing himself. He struggles with understanding language concepts. Weakness in concept imagery—the ability to create an imaged whole—prevents Chip from comprehending and expressing language well. Individuals of all ages can experience a significant weakness in the ability to create an imaged whole. 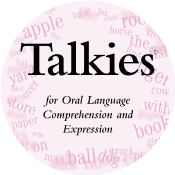 The Talkies® program—the primer to the Visualizing and Verbalizing (V/V) program—is designed for students who need simpler, smaller steps of instruction to establish the imagery-language connection. The goal of Talkies is to develop the dual coding imagery and language as a base for language comprehension and expression. Talkies is especially helpful for students with a limited oral vocabulary and/or limited ability to verbalize. Research indicates Talkies benefits students previously diagnosed with an autism spectrum disorder. Talkies is also ideal for any preschool child.